An example of consciousness operating at its finest … meant to show us all that we are capable of much more than we have ever dreamed possible. Challenges us to be all that we can be and offer us hope. 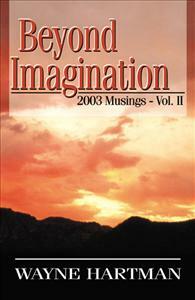 This book is a collection of Musings of a Spiritual Warrior from 2003. It continues where 2003 Musings – Vol I left off covering May through October. It is split into two sections. The first section contains the musings. The second section contains 660 quotes that have the most potential to change the world … or at least impact it. The musings are spiritual works that come from the depths of my being. I share them in the hope that they will help to awaken something within you and move you to express whom that you truly are more fully.